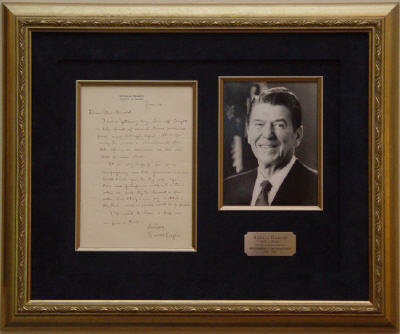 Autograph - 503301 President Ronald Reagan autograph letter signed, referring to campaigning and hoping to "harvest a few votes"
Ronald Wilson Reagan, 1911-2004. 40th President of the United States. Excellent political content Autograph Letter Signed, Ronald Reagan, one page, 7¼" x 10½", Pacific Palisades [California], January 20 [no year], on personal stationery. Reagan writes to express his hopes of scheduling a political appearance. In full: "This is �getaway day,’ I’m off tonight on the first of several tours scheduled from now through April. It is too early to make a commitment for late spring or early summer so let me take a rain check. / It is my hope to do some campaigning once the primaries are over. Could I ask you to try me again then and perhaps we could set a time when we could try to harvest a few votes. One thing I can say is that a day time - noon or earlier would be preferable. / I’ll wait to hear and hope we can find a time." This letter is in very fine condition. The ink has browned, and the paper shows faint lines around the edges, suggesting prior framing. The ink, however, is still dark and nicely readable. The letter has been richly double matted in marine blue suede, with an inlaid silver fillet and an engraved silver identification plate, and framed in an ornate silver wood frame.